There's no shortage of places to shop, both online and offline, from Reformation to Bergdorf Goodman. We help you filter through all the shops by providing you with the brand names they carry and where you can find them. It’s one of the most popular brands on Passerbuys for a reason. The sustainable clothing brand has been recommended for its effortless silhouettes and contemporary yet classic designs. While it is popular online, the shops with smart technology in NY and LA have gained popularity in recent years. Founded in 2005 by Jade Lai in Los Angeles, this boutique that carries rare and upscale labels has reached enough popularity that an additional flagship store was opened in NYC in 2010. Suzzan Atala of Tuza Jewelry, as featured on Meet the Makers, has collaborated with the brand for the SS17 season featuring a pair of chandelier earrings they designed. This Brooklyn store opened in 1999 as a source for locally and sustainably produced independent collections made by new and upcoming designers. The people behind Bird take pride in promoting eco-friendly values to its community by supporting intelligent designs that keep the local customer in mind. Artist Clémence Vazard says, “I choose to buy good quality things that don't wear out and that I really love because they represent who I am. Not because they are fashionable this season. That said, the only brand and shop I like to go to is the Sessun boutique.” With a brick and mortar space in Paris, the Sessun brand can also be shopped online internationally. Featured on Meet the Makers, Anthom was founded by Ashley Turchin in 2013 who “already anticipated the shifting direction of retail, and built a store that offered consumers more than just another place to mindlessly pick up new additions to their wardrobes.” This flagship store in Lower Manhattan carries upscale brands and emerging designers of clothing and accessories. Author of Sweetbitter and LA passerby, Stephanie Danler, says, “[My best friend] Alex McKenna has been dressing me for over a decade! 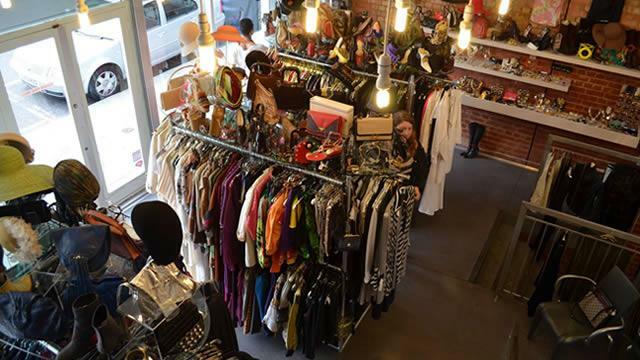 Tons of vintage, Reformation, Christy Dawn, Rag & Bone.” Featured in her Guide to LA, the Christy Dawn showroom is home to vintage-inspired pieces made from local fabrics and sustainability in mind. Other shopping recommendations include Totokaelo in New York (as recommended by Noemie Le Coz, Melissa Flashman, Leta Sobierajski, Dianna Cohen, and Naura Keiser), Crossroads Trading in Los Angeles (as recommended by Julia Corsaro), and Kaight in Brooklyn (as recommended by Elizabeth Novogratz).